View from the lower falls bridge. The weather has turned to warmth and sun this past week or so in Seattle. Early last week, with the promise of a nice weekend ahead, my husband suggested a hike. If you don’t know my husband, he isn’t the most outdoorsy type, which is why him getting the ball rolling made me proud. How could I say no? To make it even better, my sister was free to join as well. I quickly purchased the hiking with doggies in Washington book I’ve been meaning to buy for years and found an ideal starter hike for the season that wasn’t too far away in drive time: Twin Falls, off of I-90 near North Bend. Temperance on the lower falls bridge – happy! River vantage points are all along the start of the trail. 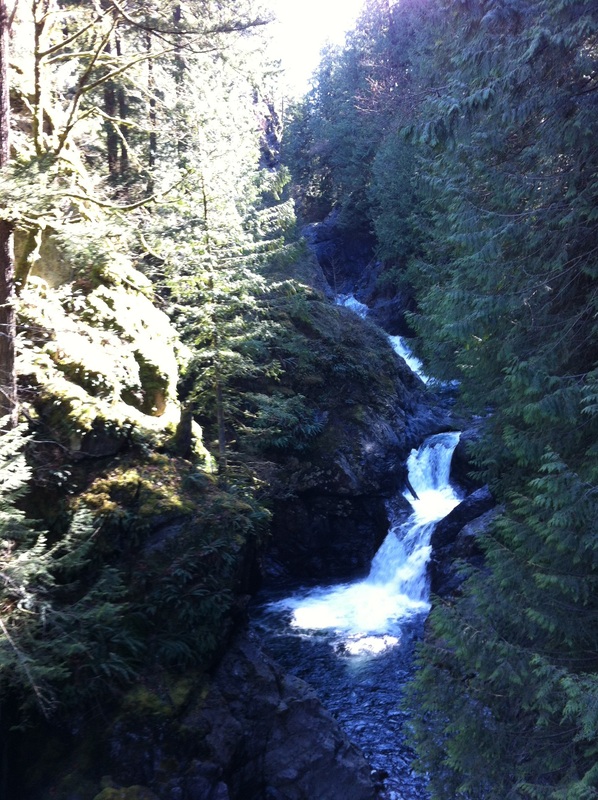 With Ichigo and Temperance in tow, we hiked the round-trip 3-mile path in one hour, admiring views along the way of the upper and lower falls that flow into the South Fork Snoqualmie River. The well-maintained trail was pretty flat at first. A switchback carried us higher up into the first incline of the sojourn. At the top, a vantage point of the valley with benches offered a resting point, but we pressed on down the path (the down part meaning we’d have an uphill on the way back too, which later left us breathless and led us to pause at the vantage point). 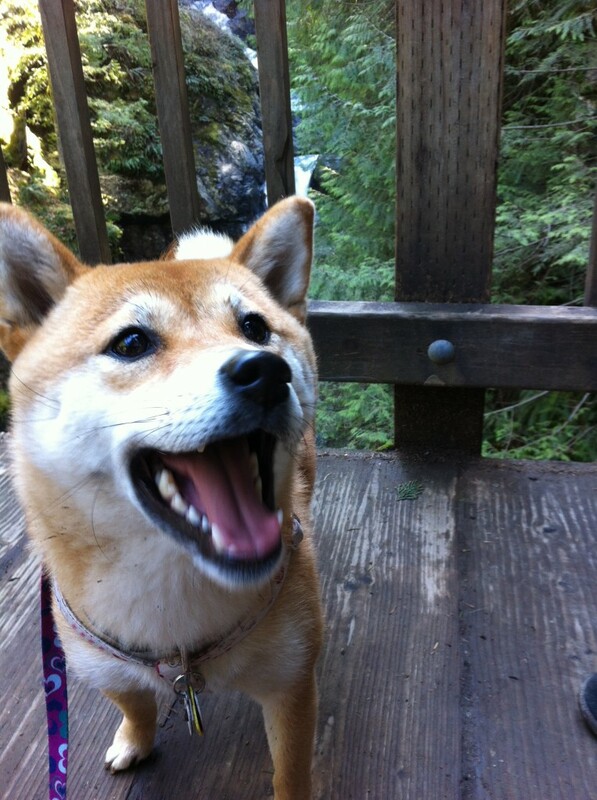 The trail ambled upward again at a steady rate to the bridge over the lower falls. Along the way, an optional stairway heads down to a vista point, but that part of trail was closed for repair. From the lower falls, steep stairs led us to the upper falls. We continued on a little further past that point and then turned around to round-trip it back to the car. 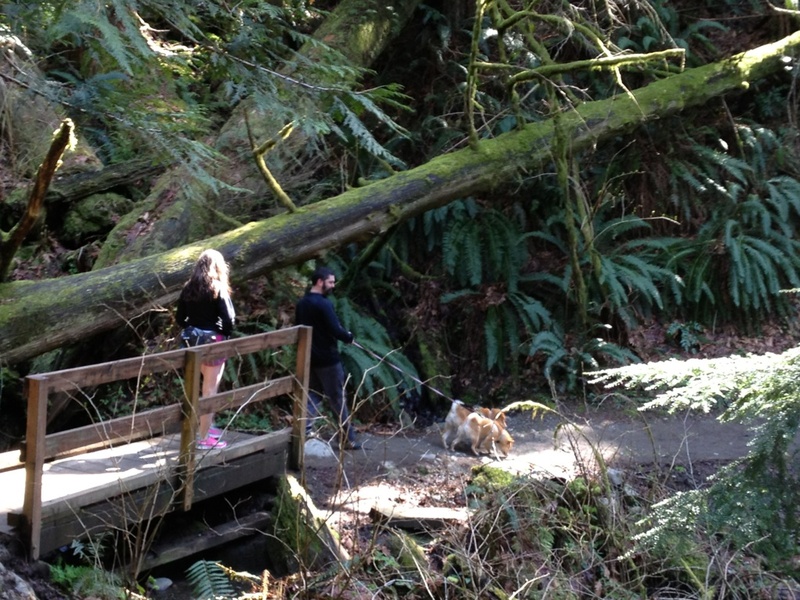 Courtesy of my sister: Me, hubby and puppas crossing a bridge on our way up to the falls. 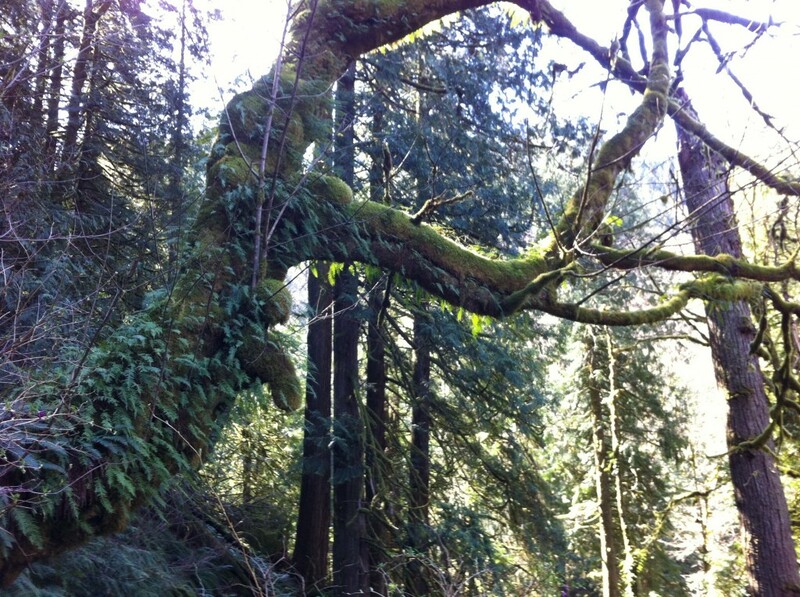 The rain in the valley where Twin Falls lies created a beautiful, mossy, Pacific NW rainforest. 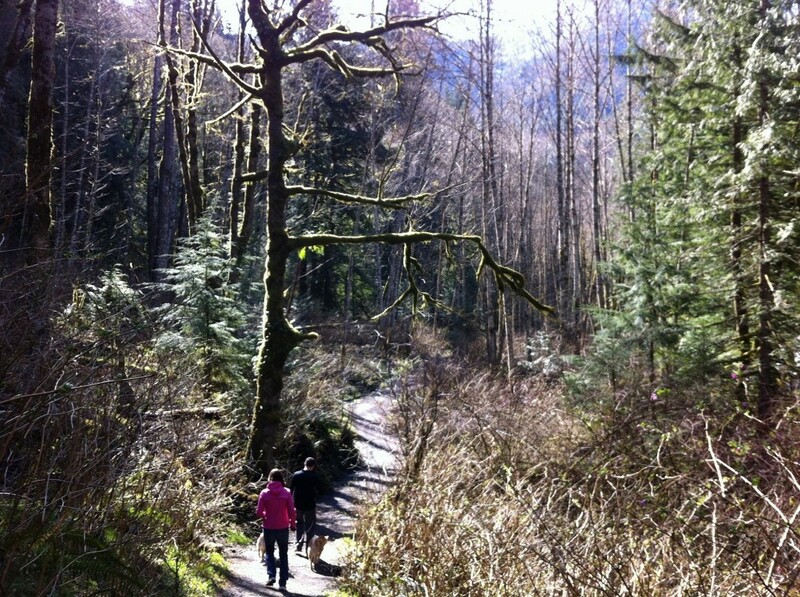 The sun shining through the trees with the bright, soft green moss silhouetted was true Seattle loveliness. An amazing tree growing on a downslope. Love the moss! Hiking difficulty: 2/5 – Twin Falls is a great starter hike for the season if you’re a little out of shape, or if your doggies aren’t used to hiking; the length of the hike and overall elevation change will give you a little challenge without wrecking you for the whole weekend. For the Seattle area, the locale is only about an hour out, giving you a pretty hike without having to head far north or into the Olympics making it a great half-day hike including travel time. 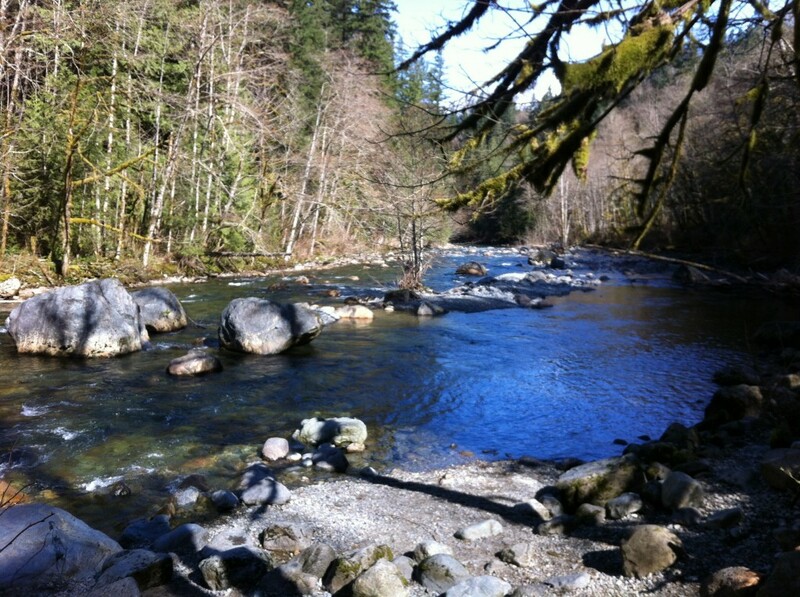 This entry was posted in glimmer&glow, sparkles, wiggles&whiskers and tagged doggies, hiking, Pacific NW on 10 April 2012 by cheryl.